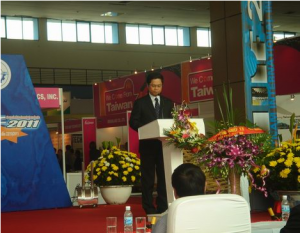 EVP attends the 20th Vietnam International industry Fair 2011- Vacuum Pump - EVP Vacuum Solution! Fair booth number : A3 – No.84. 1.The gate of the Vietnam industry Exhibition. 2.Government official is making a speech at the beginning of the fair. 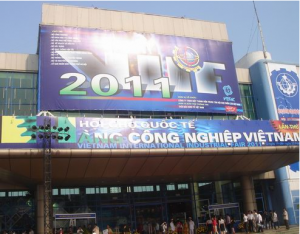 The 2012 Vietnam International Industrial Fair (VIIF) will take place at the Giang Vo Exhibition Center in Ha Noi between October 17th and 21st. Covering 45,000sq.m, the event draws 200 booths by Vietnamese and foreign enterprises from China, the Czech Republic, the Republic of Korea, Russia, Taiwan and some ASEAN member countries. On show are the latest equipment and technologies for processing, medicines, garment and textiles, traffic vehicles and mechanics, to name a few. According to the fair’s organization panel, due to the recent global financial crisis, some traditional customers inside and outside the country are not joining the VIIF 2012, or are joining at a smaller scale.